Manager’s Agenda #2. Transmitting Communication from Louis A. DePasquale, City Manager, relative to the appropriation of $44,000 from Free Cash to the Public Investment Executive Department Extraordinary Expenditures which will be used to assist the Department of Conservation & Recreation in constructing an ADA accessible canoe and kayak boat launch. I remember back in 1999 when the City first partnered with MDC (now DCR) to invest $1,500,000 to upgrade Magazine Beach in exchange for priority in field scheduling. This satisfied what would otherwise have been a need identified in the Green Ribbon Open Space Report (2000) for access to a community park for the Cambridgeport neighborhood. Most of that investment went toward the fields and landscaping in the eastern part of Magazine Beach. The City’s later investment (approx. $300,000 plus over $700,000 in matching funds and capital expenditures by DCR) has been focused on the western part, and a lot of credit for that goes to the Magazine Beach Partners (originally formed out of the Cambridgeport Neighborhood Association as the Friends of Magazine Beach) for spearheading the renovations of the old powder magazine and its vicinity. This is civic activism at its best. Manager’s Agenda #3. A communication transmitted from Louis A. DePasquale, City Manager, relative to Awaiting Report Item Number 18-17, regarding the status and proposed next steps to advance the urban agriculture initiative. The City already established regulations for the keeping of honeybees (Dec 2017) and will soon address hen-keeping (as opposed to henpecking), but this report is specific to "urban farming" whcih will include zoning recommendations affecting "the cultivation of agricultural products for public consumption". It does not affect home gardening. The zoning recommendations are expected in Fall 2018 and will require City Council approval, and soil safety regulation will be determined by the Commissioner of Public Health. Manager’s Agenda #4. 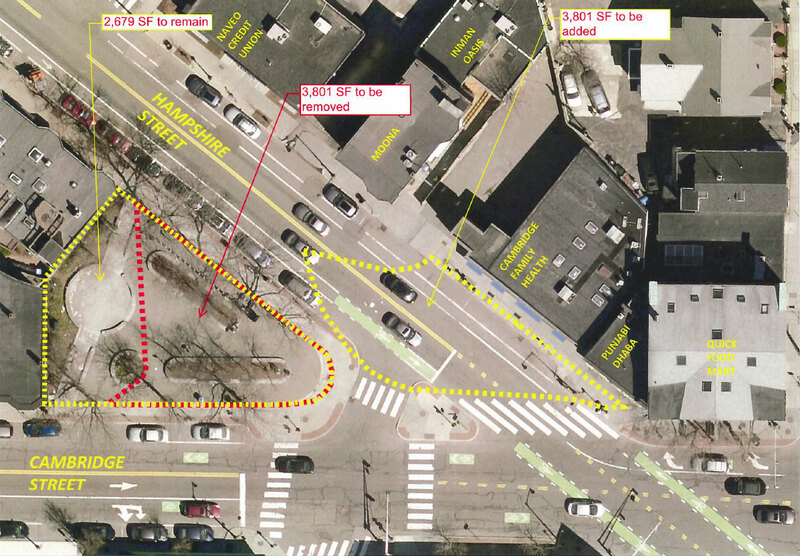 A communication transmitted from Louis A. DePasquale, City Manager, relative to a request for approval to submit the attached Home Rule Petition that would authorize the City of Cambridge to include as part of the Inman Square Intersection Safety Improvements Project (“Project”) the planned reconfiguration of the intersection of Hampshire Street and Cambridge Street in the Inman Square area of the City (hereinafter, “Inman Square”) as well as a portion of the land that makes up Mayor Alfred E. Vellucci Community Plaza (“Vellucci Plaza”). This agenda item will likely be the centerpiece of the meeting. There are a few points that warrant comment. First, the substance of this matter is the Home Rule Petition to the state legislature to swap existing designated open space for new "open space" in order to facilitate a realignment of the roadways. That has its own controversies, including different viewpoints regarding preservation of trees in the short and long term. The reconfiguration of the road is being supposedly done for the sake of safety for pedestrians, cyclists, and motor vehicle operators, but it is not at all clear that the proposed configuration (at considerable cost) will actually improve anything. The City routinely invokes the "Vision Zero" mantra to justify non-debatable changes in infrastructure with the assertion that all decisions are "data-driven", but at one recent meeting on this topic it was asserted by someone very close to the debate that there have been no accidents at all in Inman Square since the simple application of green paint to the roadway to better clarify the presence of cyclists as they pass through the intersection. What seems quite clear in the proposed road reconfiguration is that it is centered on pushing all cyclists to use the sidewalk as they pass through the intersection (which many cyclists simply will not do – and for good reason). Will this result in fewer traffic incidents? Or will there be a spike in altercations between cyclists and pedestrians? Will cyclists who choose to use the roadway have their safety compromised? Personally, though I suppose there may be some room for improvement, my sense is that the "short term" fixes of painting the green lanes and restricting some turning movements have addressed most of the safety issues and that this next round of "improvements" may actually make things worse. The proposed changes seem more ideology-driven than data-driven. There is a lot to be said for intuitive and simple road design, and this is anything but that. PS – It is stated in the report that "the Mid-Cambridge Neighborhood Conservation District Commission approved the proposed Plaza design", but I heard from one member that this was only because their authority extends only to buildings and not to roadways, and since there are no buildings involved in either the land swap or the road design they didn’t have standing in this matter. Manager’s Agenda #5. A communication transmitted from Louis A. DePasquale, City Manager, relative to a request for approval to seek authorization from the Massachusetts Office of the Inspector General (the “IG”) for the City to use the Construction Manager at Rick (“CMAR”) procurement and construction method (the “CMAR Method”) in connection with the redevelopment of the Foundry building. How many years has it been now since we received this "gift" of the Foundry building? Unfinished Business #1-4. Appropriation and Loan Authorization Orders for $5,000,000 (Municipal Facilities Improvement Plan); $650,000 (School building infrastructure projects, and a new boiler at CRLS); $61,500,000 (water pollution abatement projects, including construction of sewer separation, storm water management and combined sewer overflow reduction elimination improvements within the The Port neighborhood, and the River Street neighborhood); and $21,000,000 (reconstruction of various City streets and sidewalks). Committee Report #1. A communication was received from Donna P. Lopez, City Clerk, transmitting a report from Councillor E. Denise Simmons, Chair of the Finance Committee, for public hearings held on May 1, 2018, May 8, 2018 and May 9, 2018 relative to the General Fund Budget for the City of Cambridge for Fiscal Year 2019 and recommending adoption of the General Fund Budget in the amount of $597,219,385. Committee Report #2. A communication was received from Donna P. Lopez, City Clerk, transmitting a report from Councillor E. Denise Simmons, Chair of the Finance Committee, for a public hearing held on May 8, 2018 relative to the Water Fund Budget for the City of Cambridge for Fiscal Year 2019 and recommending adoption of the Water fund Budget in the amount of $13,973,855. Committee Report #3. A communication was received from Donna P. Lopez, City Clerk, transmitting a report from Councillor E. Denise Simmons, Chair of the Finance Committee, for a public hearing held on May 8, 2018 relative to the Public Investment Fund for the City of Cambridge for Fiscal Year 2019 and recommending adoption of the Public Investment Budget in the amount of $17,267,995. Objectively speaking, this really is the most significant agenda item, but there’s really nothing left but the vote (and, of course, the usual round of gushy thank-you’s by councillors to City staff and vice-versa). There are several available methods for re-lining pipes as an alternative to replacement including Cured-In-Place Plastic Pipe (CIPP) which uses fitted mesh and epoxy. Some people, including members of the Water Board, have expressed concerns about this method based on possible leachate, but this seems to be more a function of quality control than of the material itself. The Order states that "all plastics leach chemicals" which may be true but is not helpful. People buy water and other beverages in plastic bottles all the time and those drinks are often in contact with their container far longer than municipal water is with those pipe sections that are lined with epoxy. In addition to the matter of real vs. perceived hazard, there’s also an interesting question here of who really has the authority to make decisions like these – the Water Department or the volunteer Water Board. A century ago the Water Board had very broad authority, but it’s not so clear today where that authority ends under the current form of City government. Any such change would require either a general change in state law or a Home Rule Petition. The tax classification (residential, commercial, industrial, open space, and personal property) allows different rates (within prescribed limits) among these categories but there is no further refinement within any of the categories. This can translate into a hardship for a small "mom ‘n pop" retail business since (at least for Cambridge) the commercial tax rate is nearly 2½ times the residential tax rate, and there is nothing analogous to the residential exemption (which is a fixed exemption that can yield very inequitable benefit). Personally, I think the state legislature should create enabling legislation to give cities and towns a bit more flexibility, but there is an understandable risk that this would simply result in the maximum benefit being shifted onto those who vote in the local elections regardless of the net public good. Much of Cambridge retail is being driven into oblivion by rising rents (which factor in the taxes to some degree) and shifting consumer habits (like, you know, Amazon). Tax relief may help some, but the problem is bigger than that. Why not a ferris wheel and a zipline? I do like the fact that people are drawn to this space, but it is passive for a lot of them and they may not appreciate all the activity. Regarding food trucks, there would be a certain irony in having them within 100 or so feet of the License Commission offices (but that cryptic reference is something you’ll have to ask me about). In any case, a hot dog vendor on the sidewalk would be a nice addition, though I suppose it would have to be a vegan alternative "not dog" vendor to gain approval (in which case forget I ever mentioned it). My presumption is that these requests relate to the ongoing agenda of the City Council’s Housing Committee, but these issues have also been discussed within the Envision Cambridge Housing Working Group and elsewhere. My presumption is that the concern here is the Bad Behavior of Very Big Mean Landlords, but this is, after all, the People’s Republic of Cambridge which, unfortunately, has at least some history of collateral damage against owners of rental property regardless of virtue. (1). Looking at the most recent plan, one thing is obvious: a substantial number of area parking spaces (probably greater than 30) are being removed to provide increased separation for bicycle traffic. One would suspect that this will not help Inman Square businesses but it may help cyclists–so, there will likely be winners and losers. (2). For the record, the Cambridge Bicycle Safety organization is FOR, the change. They and other cycling organizations might have preferred, at some time, other approaches like the dog bone rotary but they want to see safety improvements done sooner rather than later. (3). R. Winter’s observation that conflicts between pedestrians and cyclists might increase with the changed intersection seems correct to me. It should be noted, however, that those are conflicts which tend to occur at lower speed and lower mass resulting in less injury. (4). To my eye, the greatest change in the intersection is that it is becoming two intersections. Currently, the intersection is an X but it is about to become two Y’s with conjoined stems. Since this new intersection will be more complex, the signalization for vehicular traffic will need to be very carefully done or the intersection will lose some portion of its current throughput. Also, I’d bet that the intersection will be slower to navigate for most vehicular traffic–that’s a bad thing if you want to travel quicker but a good thing if your desired objective is relatively calmer traffic. There may be differences of quickness for bicyclists and motorized vehicles but that will depend on final details and signalization. In his remarks, R. Winter noted that there has been testimony to the effect that bicycle safety in Inman Square has already improved dramatically as a result of removing some parking and simply painting bike lanes. So, why embark on an expensive new project now? This should be investigated further and, if it is the case, then I’d agree that no expensive new intersection work should occur. Why not spend the money if we could get just a little more safety? Because we are presently in a period of immense change in vehicle types and vehicle use and we don’t know what the traffic landscape will look like fifteen years from now. You make substantial capital improvements when you are confident that you’ll get a long life out of them. With the changes now occurring in types and usage of vehicles and with the possibility of autonomous cars and trucks in the moderate term, we should not willy-nilly be making changes that might not be fit for the coming environment.